[deleted post]Dude listen to urself...ur talking like android phones have been there for ages and Samsung has ruled the market for years!! Samsung has been on top for the past year and a half and may continue...who knows?? But someone cud easily turn the tables!!! Cud b htc, cud b moto, cud b Sony!! N Sony does look super promising!! Wow, what alot Sammy boys here floating around. This is getting childish with those Sammy fanboys around here. Galaxy s2 released on october as far as i know in US , So comparing that way , Xperia which came around february is very decent and also beating out s2 in many aspects infact 4S also did beat s2 in many benchmarks and even galaxy Nexus kicked s2 into the water in every aspect from software-side to hardware-side. S2 is old school and old story , Galaxy Nexus , Xperia S , Razr are the bit good things atm , if galaxy s3 comes then story will be different again. poor galaxy S2 , Xperia S and razr still stuck at gingerbread which has no optimization or hardware acceleration. Nexus S , iPhone 4 , Galaxy nexus And iPhone 4S are running latest OS and very easily owning other phones in every benchmark and support (software updates). Single core means iP4 and Nexus S , Dual-core means iPhone 4S and Galaxy Nexus. AnonD-13694, 10 Mar 2012oh yea man. U r going 2 make Avatar 2 in ur gs3. So u need quad core. Bt we do not !I hope 1 day would be able to make avatar 2 but to be honest why if ur getting latest tech why would u go for old.dont take me wrong I am not against XS sony have done a wonderfull job on specs I hope the price of the phone sud justify that, but say for example if I will get SG3 in a little grands extra I wud go for SG3 I mean whats wrong in waiting for a while .samsung did not announce the SG3 in MWC but they will launch it. I agree that the Galaxy S2 was the story of 2011...But what is this obsession of S2 owners to prove this time and again!!! 2011 is over and the very first 2012 giant has pushed it to 2nd place. The Xperia S beats GS2 in almost every field and so will the phones to follow down the year. The S2 is a great phone but don't crawl all across 2012 claiming it to be better than every new release! Thats just stupid!!! Best Gingerbread smartphone out there!!! Xperia would've been a nice gadget half a year ago, but NOW... it offers nothing besides the 12MP camera. AnonD-22824, 10 Mar 2012SG3 is expected to have very less bezel to give us 4.5 or 4.8 inch screen it is also expected... moreoh yea man. U r going 2 make Avatar 2 in ur gs3. So u need quad core. Bt we do not ! And probably later this year they will come out with the best IceCream Sandwich droid in the market which will beat the competition again. Even if you have to wait for Sony to come up with the awesome stuff, you know its gonna come! That guy is a despret sony fan boy.clear black display?that is a nokia trade mark.whats next man?the sony experia s has sense Ui and Itunes? AnonD-13694, 10 Mar 2012with a 4.8 inch screen ? U wil need 2 change ur trouser size 2 carry dat in ur pocket. GS3 is ... moreSG3 is expected to have very less bezel to give us 4.5 or 4.8 inch screen it is also expected to have1080p full HD screen with wide aspect ratio ,12mp cam and quad core are highlights on almost same as s2 or slightly bigger size which will be easily pocketable .hope samsung will launch it soon. so,every fanboy from sammy and sony argue themselves?for sammy,they definitely will defend their sgs2 or talk about sgs3 which still in the dream.And for sony,they also want to win with their xperia s,high ppi n bla2.nokia with their mammoth 41mp n808. So,no matter what you defend,it is up to you.For me,what the needed for quad core?single core for me is still enough.coz i am not a gamerz or what.even nokia doesn't have dual core.there also no needed for amoled bla2 screen.Why?coz that handset is for us only.So,why we need to view it at 180 dgree angle? ?we will view it straight up to the screen.So,there are no dffrent btween amoled n other screen. Stop the defending of your maniac phone,every fanboyish! The Xperia S is the best phone this year untill the next Xperia high-end. Just look at the comment under me! I totally agree him!!! As someone mentioned, xperia S will get android 5.0 as there is a contract with google for all manufactures to support at least once SW upgrade. "Better Screen, Better camera, newer version of Android, NFC, MicroHDMI, better front camera, better gpu performance, faster CPU, PLAYSTATION certified, TV launcher, free content from Sony(180 days Music Unlimited Trial, 2 Playstation games and 2 Video Unlimited Blockbuster movies), Nano Coating body that repels dirt/markers/writing/etc, Mobile Bravia Engine, ClearBlack Display, fast charge capability, Much much better design, 3D camera, fast capture, equalizer, surround sound, better headphones, Much bigger Ecosystem, probably getting Android 5.0, Facebook inside Xperia, Timescape, highest PPI phone in the market with 342 PPI, bigger battery and it's a Sony..."
You are just jealous your crappy SGS can't even beat an iPhone. The S is cheaper than the S2 in the UK. Also the ICS update takes away the Bluetooth 3.0 HS part of the Galaxy S2. salsa, 10 Mar 2012and what does your xperia s have to offer?!? hdmi and bravia engine bullcrap?! you guys are ju... moreLook at the camera. Even the upscaled 12MP camera of GSII cannot match the normal camera of xperia S.And also it has #D sweep panorama. Even HD video recording is far better. 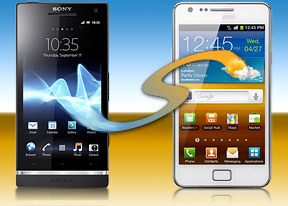 The only disadvantages of xperia S are bluetooth 2.1 and non-expandable memory. Anonymous, 09 Mar 20121 year difference and still, S2 wins. What a shame.review clearly says xs is slightly better than s2. S2 owners irritated by this and states s2 is one year old. But compare the price also the difference is very little. ( s2 is not free bcoz one year old ). For a new customer if he will pay 50$ more than s2 they will get a good value for that extra money. If anyone will sell their s2 to purchase xs had to put more money. So they have to think for that and one thing if they buy a new s2 the story will same. So forget about one year. In present situation xs is 50 $ more than s2 and it will worthfull. Sony should've come up with this phone a year ago. I love other sony devices, I have ps3, MDR-v900HD cans and planning to get ps vita as soon as I get my mid-year bonus but this xperia s won't have a place in the 2012 world of smartphones with these specs. Looking forward to sony's hayabusa, but until then, i won't consider this as a better upgrade for my galaxy s2.